German Forward Rouven Haenig (198-F-86, agency: Scorers 1st Sportmanagement) is a relativly unknown prospect fresh out of college. Eurobasket.com Germany had the chance to sit down with Rouven and help him get introduced to the german basketball audience. He spend the last four years at the NAIA school Missouri Valley and averaged 11.5ppg and 6.1rpg in his senior season. 1. Please introduce yourself a little bit to the german basketball fans. My name is Rouven Haenig, I am 23 years old and have been born and raised in Bonn, Germany. I started playing basketball at the age of 12 and shortly after starting to play ball, I quit playing soccer. I played for a few different clubs including the junior teams of the Telekom Baskets Bonn as well as the SG Sechtem, however at that time basketball was still just a hobby. At age 16 my parents decided to send me to a school in England to improve my language skills, which is where I really started to love basketball. I worked hard for two years there and decided to try and give college basketball in the United States a shot, which has always been a dream of mine. I attended a college try-out in the USA and received a number of scholarship offers among them was one for a small college called Missouri Valley, which I ended up choosing. 2. 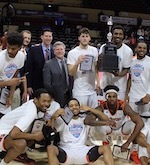 How was playing for Missouri Valley in the NAIA? At first I was not very happy about playing in the NAIA as I wanted to play for an NCAA College. When I arrived on campus, the school was basically in the middle of nowhere and was definitley not what I had signed up for. The only positive was that there was not a lot that could distract me from my studies and basketball. I quickly realised however, that I was in for a big surprise. 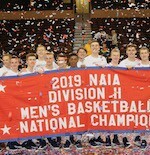 Basketball was taken very seriously and we practiced as much and as hard as anybody in the country whether NAIA or NCAA. It was very tough for me, especially during my freshman year, to adjust to the rough and intense practices and the conditioing which started as early as 4.30 in the morning. It took me about a year to adjust, and once I got used to the fact that basketball was going to be taking up most of my time, things got better. My coach trusted me and put me in the starting five my sophomore year, and from then on my game improved every year to eventually leading my team to a 20 plus win season and receiving all-conference honors. After playing against numerous NCAA Division 1 and 2 schools during my four year college career, I can honestly say that the NAIA is not the joke that a lot of people think it is. Being underrated is part of my game and I don't really mind that at all. 3. Where do you want to play next season? Having been away from home for pretty much the last six years, I am really looking foward to playing closer to home and possibly in Germany. I don't really mind where I am going to end up playing, as long as I get a chance to prove myself and possibly play. If the team is the right fit for me then I would like to contribute my part to a good team whatever that may be. I am really looking foward to playing and I'm very excited about next season. 4. What are your hobbies off the court? How do you spend your free time? When I don't play or practice, I really like to read, hang out with friends or play other sports such as ping pong or beach volleyball. Other than that, I am really laid back, like to chill and have a good time. 5. Do you have any ambitions to play for the german national team anytime soon? I haven't thought about the National Team at all. Right now I am very excited about the chance of playing in my home country. Preparing for the next season to the best of my ability is all I am focussed on right now. 6. What are your plans for the summertime? During the Summer is the time where players really get better, which is what I plan on doing. After a long college season I needed to rest my body, however after a few weeks of rest, I will be working out every day to get ready for the next season so I can have a good first year after college and prove myself coming from a small NAIA school in the middle of nowhere.